This is one of my girls during her “I don't want to wear tights” phase! It's only a phase, it's only a phase, it's only a phase…..I have been saying this over and over the past 16 years! I remind myself of Dorothy from the Wizard of Oz….there's no place like home, there's no place like home, there's no place like home! It's only a phase….this is in regards to practically everything my child or children are doing at any given time! I guess I really didn't start repeating this statement until child #2 came along! So maybe I have only been saying it for 13 years! HA!! 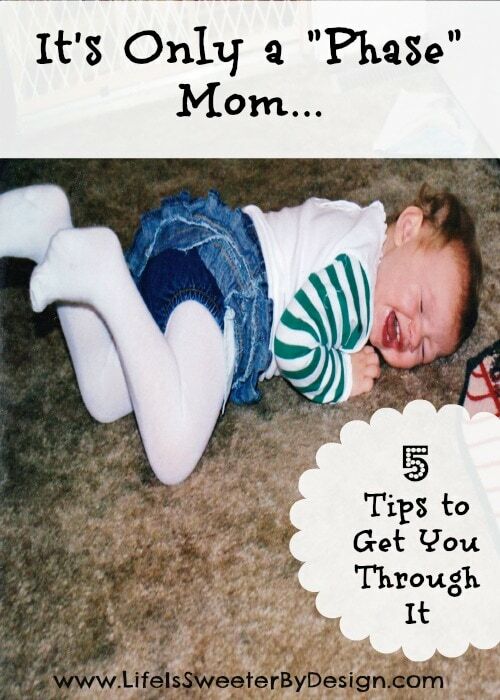 During my first couple of years of motherhood…some phases seemed like they would NEVER end or get better! I am talking about things like: babies not sleeping through the night, tantrums in public places, potty training, hitting, saying “NO” to everything, biting, whining….the list could go ON and ON! I am sure any mother reading this could form her own list. Now there are some phases are that delightful…..but so many phases that are hard…hard…hard. The hard phases seem to last forever and that is when we try and remind ourselves that It's Only a Phase! The good news is that in reality they don't last forever! When my son was a baby and toddler I would get so weary during a difficult phase. I wasn't experienced enough to realize that it was temporary. I let the phase GET TO ME. I let the current “issue” steal some of my joy….the joy of being a mother. I am so glad that I have learned some lessons along the way. Yes…it was annoying last year when my 10 month old slapped everyone who picked her up…it is hard to teach a 10 month old a lesson! 🙂 So I just apologized to whomever she had slapped and did my best to redirect her…and thought to myself…this won't last long! Guess what? It was over within a few weeks and we were on to the next thing! Because I have kids that span over 15 years….an almost 17-year-old, 13-year-old, 8-year-old and just turned 2-year-old…I am seeing that even as the kids get older…they still have phases. The sullen phase, the question phase, the talkative phase, the hide-out-in-your room phase. I may be surprised to find that phases will even exist when they become adults. Being a mother is by far the hardest job I have. I am sure that most moms would agree with that. I don't want other mom's to lose the joy in life by getting bogged down by the phases! Step back from whatever it is that your child is doing that is driving you crazy….just step away and take a few deep breaths. You may be surprised how this simple technique will help you refocus. I have walked away from a screaming baby before….from a toddler laying on the floor kicking their feet…etc. I just went into another room and paused my mind for a moment. It is almost like letting your mind reset! When my daughter was in her “I'm afraid of sleeping in my room” phase….I remembered that one of my other kids had gone through that one too! I thought back and remembered…it didn't last forever! If the phase you are dealing with involves a baby or toddler…it is especially important to remember that it won' t last forever! Those phases are sometimes the quicker phases to get through. Just reminding yourself that this is a temporary issue can help you regain for stamina to make it through another day! It helps to talk to other people who may be going through the same thing that you are. It helps to commiserate with each other. They may have some helpful advice to make the phase a little easier to handle. If you don't have any mom's with children the same age as yours that you can talk to…try connecting on social media…or on blogs! You may just need to call your own mother! I still call my mom at least weekly with a question about my kids! This should probably be moved up to #1…God DOES care about the little things that are upsetting us. I remember asking for God's help on so many occasions when I was at my wit's end with a screaming baby! He can give you the peace and the strength to get through these phases! Ask other Christians to pray for you also. The more the merrier when it comes to prayer! As a mom with one so close to leaving the nest….and a toddler trying to destroy the nest. I am trying so hard to remember that these phases will someday be looked back on fondly. There will come a day when I will give anything to go back to It's Only a Phase…just to enjoy that child at that age again! Remember to keep JOY at the focus of your day! I definitely went through every single one of those phases! My poor mother is a saint when it comes to her level of patience. As I grow older and wiser, I have realized it’s because my mother is naturally a very calm, gentle, caring person. That helped a lot, knowing she was there to support me through difficult adolescent years with a piece of advice or just being good company. I agree…I don’t know what I would do without my mom nearby!! As a mom of 9 (5 bio, 4 adopted) ages 14-28, I can assure you that each difficult phase is well worth working through 🙂 I’m enjoying an evening right now with most of my kids (one is home from out of state for a vacation) and feel so blessed to have all of them! My mom definitely was a huge help, and I’ve prayed through many issues, but they are the best blessings that God could have graced us with. Enjoy your blessings, stages and all! I don’t have kids and don’t plan on having any, butttt I’m on my pediatrics rotation right now, and these would be great to pass along to new (or new-ish) mothers! :] Thanks for them! Good idea…many moms really look to their Dr. for advice when they are at their wit’s end!! This is some great advice for moms at their wit’s end! I’m not a mom yet, but I’ll keep these tips in mind for the future 🙂 Thanks for sharing! Love your advice! It will get better soon…well hopefully! Oh my, YES. 🙂 I repeat “This, too, shall pass.” (The magical words that will make a sad person happy and a happy person sad!) The years have taught me that a sleepless night won’t kill me, tantrums end, teeth eventually come in, and every child, God willing, grows out of the terrible toddler years. When my grandmother was 88 and held my firstborn son, her *fourteenth* great-grandchild, she looked at my father with tears in her eyes and asked, “Where did the years go?” That has kept me from wishing away the tough times, and I hope it has made me a better mom. I have to keep that in my head also…I know the years are flying by!! Thanks for your insight! Sometimes the stages that children go through seem like they will never end. These are some great tips to get through them! I totally agree. my 1st seemed to be a baby forever. now my 7th is going to be one in the blink of an eye!